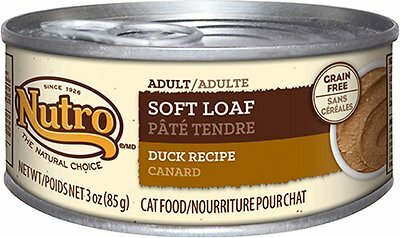 Your kitty goes wild for pate, so give him the nutrition he craves with the Nutro Adult Soft Loaf Duck Recipe Grain-Free Canned Cat Food. Featuring real duck in a whisker-licking tender loaf, it provides plenty of protein for healthy muscles and yummy flavor for a satisfied tummy. Every bite is also packed with all the nutrients your pal needs to look and feel his best every day, like vitamins, minerals and essential taurine. Plus, it also provides plenty of moisture to help keep him hydrated and healthy from nose to tail! And with no grains, fillers or anything artificial, even sensitive kitties can enjoy. Adult wet food recipe features real duck as the first ingredient for the protein needed to support healthy, lean muscles. 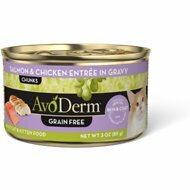 Soft, tender loaf pate with smooth texture is perfectly lap-able and easy for cats to eat. 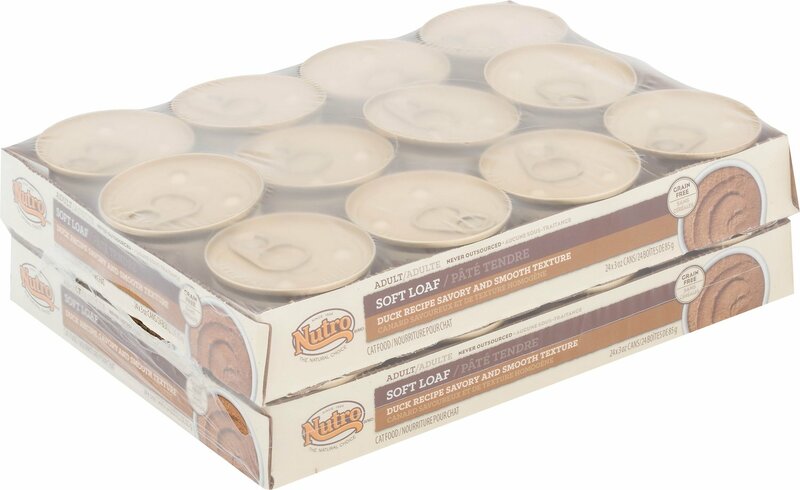 Made in USA Nutro facilities with only natural ingredients that can be traced back to trusted suppliers, and no artificial flavors, colors or preservatives. 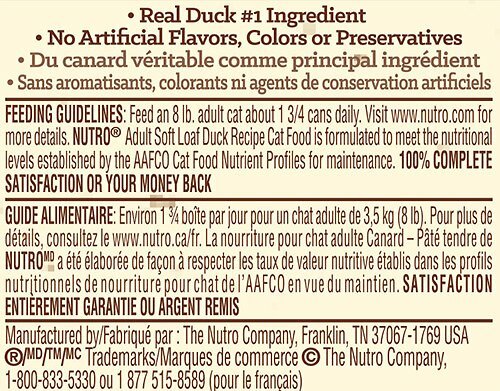 Duck, Chicken Broth, Duck Liver, Pork Broth, Natural Flavors, Minerals (Calcium Carbonate, Magnesium Sulfate, Potassium Chloride, Ferrous Sulfate, Zinc Oxide, Copper Proteinate, Manganese Sulfate, Sodium Selenite, Potassium Iodide), Guar Gum, Carrageenan, Sodium Phosphate, Fish Oil (Preserved with Mixed Tocopherols), Vitamins (Choline Chloride, Thiamine Mononitrate [Vitamin B1], Vitamin E Supplement, Niacin, D-Calcium Pantothenate, Pyridoxine Hydrochloride [Vitamin B6], Vitamin A Supplement, Vitamin D3 Supplement, Biotin, Vitamin B12 Supplement, Folic Acid), Salt, Taurine. To feed alone: Feed an 8 lb Adult cat about 1 3/4 cans daily. To mix with dry: Reduce dry food by 1/4 - 1/3 cup per can. For more precision, replace based on calories. My 2 Toms Duke And Maxwell love this product as they turn circles waiting for their portion. I love to watch them after eating as they are so contended they roll around on the floor and then start chasing each other around the house. My cat, Violet-Mae, has IBD. After her favorite food's recipe was changed, she turned her nose up after smelling it. Her sister loves the Nutro Chunky Chicken Soft Loaf. I saw the Soft Loaf Duck Recipe and decided to try it. She LOVES it! She prefers liver in her cat food--this is exactly what she not only ordered, but demanded! Thank you Nutro and Chewy. Quackers are a Mood Thing! My two babies (boy and girl - 3 years old) like the duck if they're in the mood. But when they are in the mood they devour it! Pretty happy with most of the ingredients. I cringe when I think of the ducks but realize my babies must eat. BTW my grannies (two old ladies - 15 and 16) not like it. Delicious duck & happy cat! My cat loves this! She asks for it and happily eats it. I switched from canned chicken to this & turkey because her allergies were acting up and now no more allergy symptoms. My kitty has been refusing a lot of foods lately. I've only been able to get her to eat other foods if I mix in kitten formula or top it with freeze dried food. Not this one! She's eating it as is. Very pleased! I got a new cat recently and she really enjoy this food! I hope that they will make a bigger size. 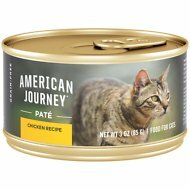 All 3 of our cats, our two ~2 yr olds and one 11 yr old, enjoy this food. They’re not particularly picky, though. I wanted to get the duck to cut down on their fish intake and I wanted a soft pate because we split a can 3 ways and mix with equal parts warm water for their dinner. The price is right, the quality seems great, and the cans are easy to open and get the food out of (some pates we’ve tried are goopy and stick to the can or have poor quality control on the cans themselves). The cats are happy, we’re happy. No complaints. 3/3 cats approve, and there has been no loose poops or dull coats. I and my cats are happy with this food. My two kitties will eat it, but it is not exactly their favorite.